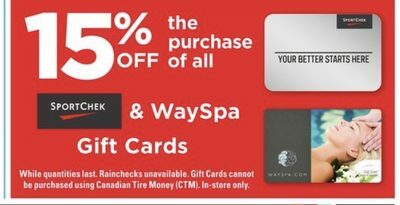 I was flipping through Canadian Tire’s flyer and noticed they are offering 15% off Sport Chek and WaySpa gift cards! I’ve been waiting for Sport Chek gift card sale for awhile. The sale is available from April 11-17, 2019 or while quantities last. If it’s anything like previous sales, these will likely sell out or be hard to find after the first couple days. If you want to use the gift cards to shop online, look for the gift cards with the scratch-able pins on the back – only those can be used to shop online. Click here to view Canadian Tire’s flyer. Click here to find a Canadian Tire near you. Click here to shop Sport Chek online.